People who love cats adore just about everything about them. What’s not to love? Cats are adorable, entertaining, and a joy to be around. Although cats are almost perfect, one of the less appealing aspects of living with them, as well as other animals, is that they have to relieve themselves at least once a day. 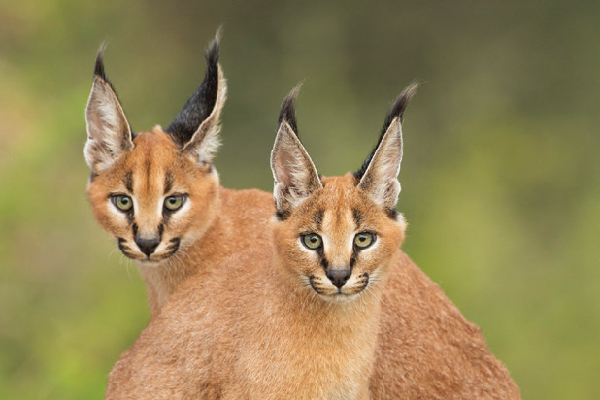 Felines do have an advantage, though, they do not have to be walked or let outside to do their business. Most are content eliminating indoors, in clean, well-placed litter boxes. 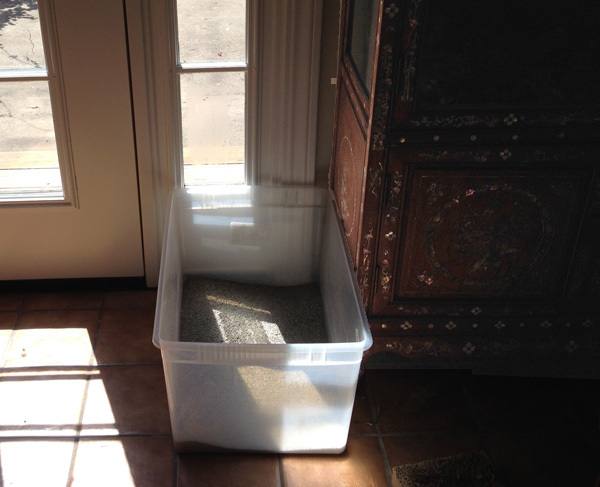 Cat parents find creative places to put litter boxes. Some of these locations encourage good litter box habits, others do not. 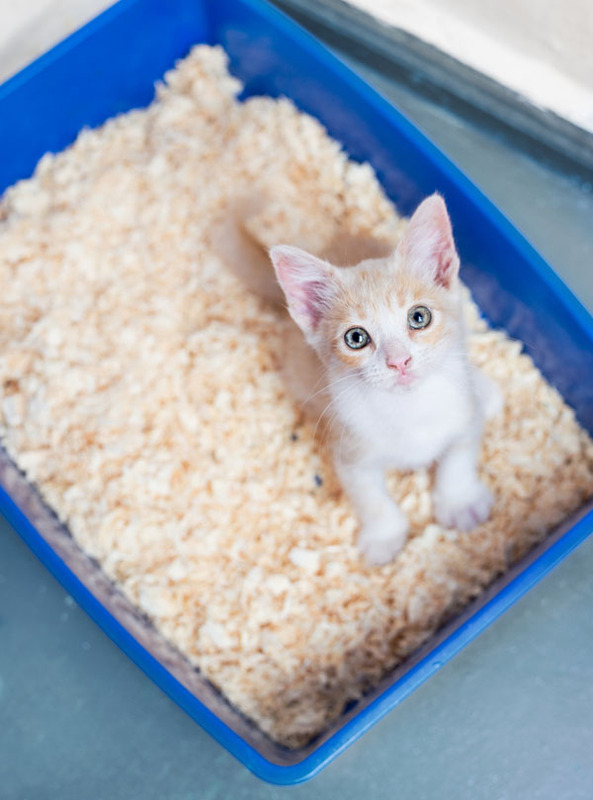 Although medical issues, stress, litter box choices, and poor maintenance can also cause cats to eliminate in unwanted places, litter box placement plays an important role in the boxes’ use. Additionally, although many cats faithfully use litter boxes that are in less-than-ideal areas, certain litter-box locations can cause kitties to feel stressed and anxious. Some locations are better than others. 1. Respecting cats’ privacy. 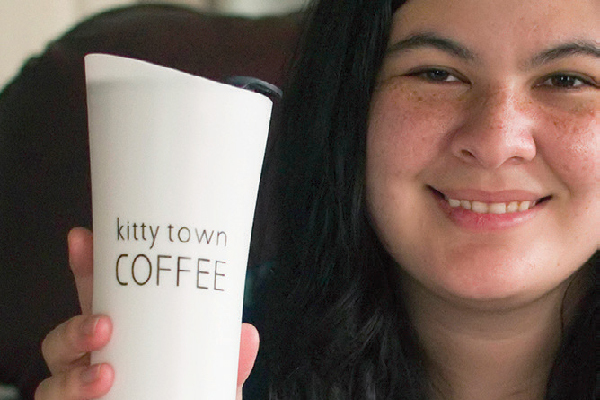 Many well-meaning cat lovers think their cats prefer to do their “business” in private. They view the situation from their own perspectives. Since they prefer privacy, they assume that their cats must too. 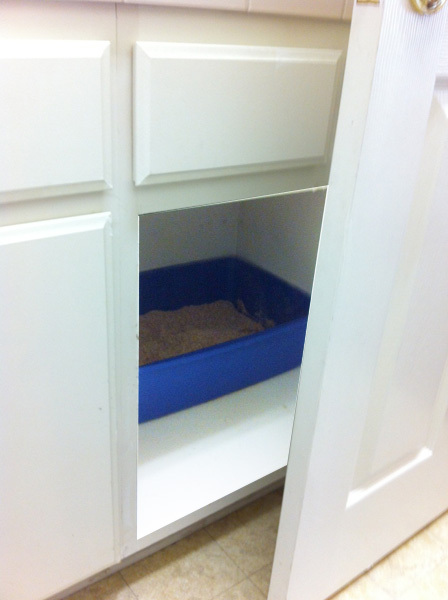 Litter boxes are tucked away in cabinets, behind bathroom doors, in shower stalls, closets as well other out of the way places. 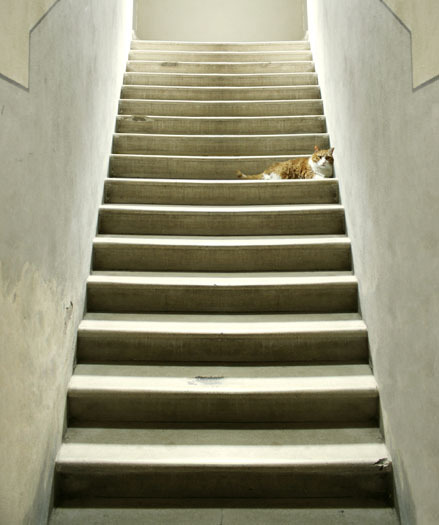 These locations may work for humans, but are not ideal for the ultimate users — the cats. From a cat’s perspective, being safe while doing one’s business is more important than privacy. Litter boxes placed around corners, in cabinets, behind couches, in closets, and small rooms are setups for ambush — cats can easily be trapped. 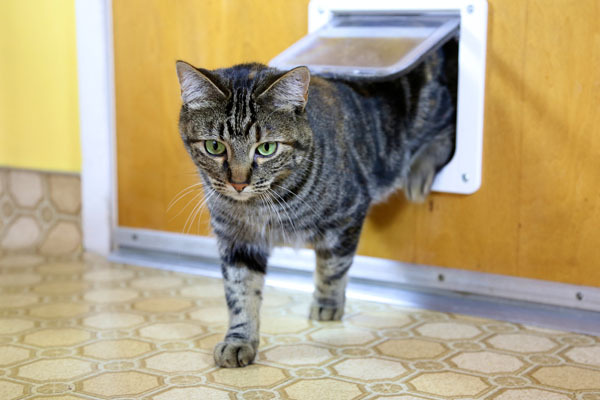 Pet doors are also problematic because cats cannot see whether another animal is waiting to pounce as they climb through them. Instinct prevails, even when there are no other resident animals around. 2. Keeping litter box odor at bay. Odor is also an issue in enclosed spaces. 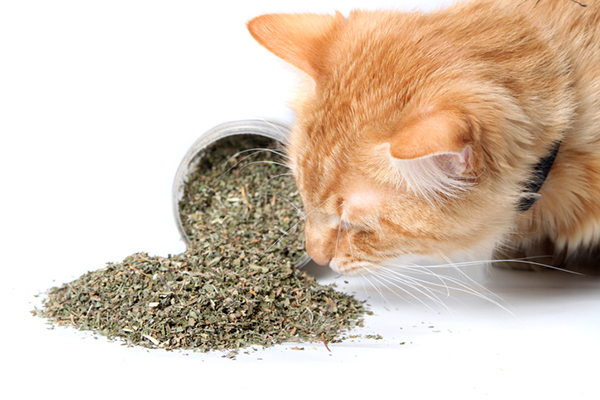 Cats are not the only ones who have difficulty escaping — odors do too. Cabinets, closets, and other small rooms retain smells. Although people may not smell the litter boxes, cats do. They have a highly developed sense of smell and will avoid going to the bathroom in areas that smell offensive. 3. Considering aesthetics first. Litter boxes are sometimes hidden from view so that friends and family do not see or smell them. Often they are housed in remote areas — basements, garages, and attics. Although kitties do their best, some just can’t make it to their boxes in time. This is especially true for kittens, elderly cats, and those who are impaired. 4. Considering human convenience first. 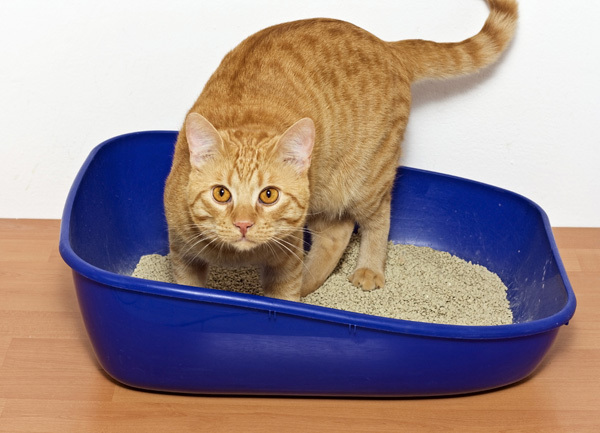 Some people place litter boxes together in the same room — often within inches of each other. From a cat’s perspective, this is the same as having one litter box. If for some reason the room where the boxes are housed does not feel safe, cats often will find other places to eliminate. Litter boxes should not be put next to food bowls. If cats have a choice, they will not eat next to where they go to the bathroom. Another common mistake is placing the boxes in high traffic and noisy areas — places people and other animals have to walk, in order to go from one room to another. 1. Considering cats’ needs first. Felines prefer litter boxes that are placed in low-traffic, quiet areas that have expansive views. These spots are sometimes found in living rooms, family rooms, kitchens, and bedrooms. Although favored by felines, these locations often do not win the popular vote from the resident humans. Ideal locations have unobstructed views of the whole room and through doors. These areas allow litter box users to see and escape threats and animals that could disrupt their business. These are also areas where cats cannot be trapped or ambushed. 2. Placing multiple litter boxes in multiple locations. Cats need more than one litter box. The rule of litter boxes is one per cat and one for the household. If there are four resident kitties, then five boxes are needed, placed in five different rooms. Multiple-level homes need boxes on each floor. Cats need choices — if one box doesn’t feel safe, they can use another one somewhere else in the home. 3. Choosing quiet areas for the litter box. Avoid placing boxes in areas that are loud with lots of activity. Cats do not relish doing their business in the middle of a well-traversed route. Although cats are not into privacy like people are, they do not want to eliminate in high-profile areas either. You don’t need to place litter boxes so that they are the focal points of rooms; they can be placed so they are unobtrusive to people while appealing to kitties. Good spots can be found by crouching down to cat level and checking out what the cat might see and hear. Ideal locations have unobstructed views, are quiet, away from feeding stations, and in areas where cats cannot be cornered. Litter box placement can make the difference between a cat who faithfully eliminates in the litter box and a cat who avoids it. Not all elimination challenges are behavioral. Because painful and serious medical problems can cause cats to eliminate outside of litter boxes, kitties who do so should always be examined first by a veterinarian. Only after all possible medical issues are ruled out, approach the problem as behavioral. 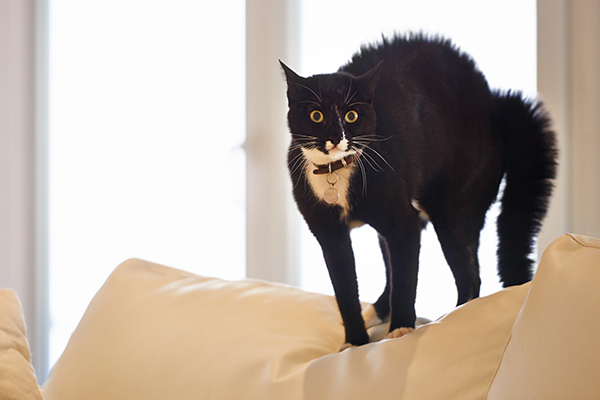 Thumbnail: Black and white cat using litter box by Shutterstock.